Today I want to talk about neck pain and some daily habits that perpetuate a common problem. Neck pain is a common complaint we see in our office, and can originate from many places. Our posture and daily habits contribute to the problem and can slow the healing process immensely. No matter where an injury originated – stress, whiplash, a fall, or another cause – our daily posture can vastly change the outcome of treatment for the good or bad. Let’s start with a little background information on the structure of the human neck and shoulders. Ideally, we would be in a position with a stacked spine, shoulders externally rotated, chin tucked in towards the body, as if a string was pulling your head and shoulders up from the ceiling. Our body is held in that position with postural muscles designed specifically to hold us upright against gravity. These muscles act like suspension cables on a bridge, tensioning the spine and holding it erect. Our heads weigh about 10 pounds on average. When stacked over our spine, the suspension postural muscles have no problem holding it in check. The average 10-pound head is about the weight and size of a bowling ball. Now, imagine holding the bowling ball close to your chest. That’s pretty easy to hold for any length of time, right? Now take that bowling ball and hold it straight out with your arms, as far from your body as you can. How long can you hold it out there, fighting against gravity? Let me tell you, even a strong athletic person feels the heavy weight really quickly. Pretty soon, your muscles are fatigued and it’s nearly impossible to hold the bowling ball up. That is exactly what is happening with your head and neck – the more forward the head, the heavier it is and the more strain on those postural muscles. Eventually they can’t hold the head up without intense pain anymore. This forward heard posture causes something called “Upper Cross Syndrome”. 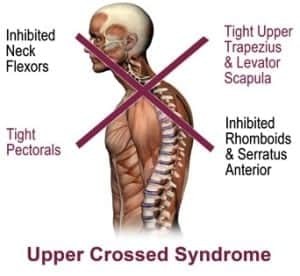 Essentially upper cross syndrome means the muscles at the front of the chest and at the back of the neck become chronically tight and shortened. The muscles between the shoulder blades become chronically weak and inhibited. Our environment of sitting in offices, typing on computers, texting, looking at tablets and phones contributes immensely to a society predisposed to neck pain, shoulder pain, and upper back pain. That’s right, I’ll say it again, poor posture leads to neck pain, but also back and shoulder pain! Postural evaluations and consciously deciding to make a change. Move. Change your position at your desk, go from seated to standing, do some stretches, and resume work. In an hour, repeat. Check in every hour while on your computer or sitting at your work desk, or even standing at your work desk (yes, standing workers can have poor posture too). Roll your shoulders back, tuck your chin in towards your spine, stack your head over your shoulders, and add some thoracic extension. Stretch the posterior neck muscles and pec muscles. Strengthen the muscles between your shoulder blades and the deep neck flexor muscles. Shoulder blade strengthening is one of the most important and most neglected, and can be accomplished through exercises such as rowing and other similar exercises. Here are some links to some great handouts: cervical strengthening, my favorite back strengthening, and cervical stretches. One of the most important aspects of our posture is constant variation. A sedentary lifestyle will perpetuate pain and injury. Changing your posture every 20-30 minutes (before you notice discomfort) will help immensely even if it’s only a 10 second stretch. Setting an alarm in your phone or downloading an app that reminds you to move can help if you’re a technologically inclined person. Write a sticky note if that helps and stick it somewhere obvious in your workspace. Get creative! The conscious decision to change your behavior takes time to show improvement. It’s likely the body is so used to the habits it has formed, it will take months to realize that you are unconsciously sitting, standing, and moving with new and improved good posture. Come see me in office to work through your imbalances and get some exercise handouts showing exactly how to strengthen the weak muscles in your back and neck to support good posture.